HBO is offering an online sneak peek of the entire first episode of the second season of The Ricky Gervais Show, the hilarious animated version of Gervais� smash-hit podcasts that earned a spot in the Guinness Book of World Records for the most downloads. The episode will be available from January 7 through January 21 on iTunes, HBO.com, HBO GO, HBO On Demand, the HBO Apps for iPhone and iPad, xfinitytv.com, YouTube, TV.com, and Dailymotion. New York, N.Y., January 6, 2011 � HBO is offering an online sneak peek of the entire first episode of the second season of The Ricky Gervais Show, the hilarious animated version of Gervais� smash-hit podcasts that earned a spot in the Guinness Book of World Records for the most downloads. The episode will be available from January 7 through January 21 on iTunes, HBO.com, HBO GO, HBO On Demand, the HBO Apps for iPhone and iPad, xfinitytv.com, YouTube, TV.com, and Dailymotion. The Ricky Gervais Show features the voices of Ricky Gervais, his longtime collaborator Stephen Merchant and colleague and friend Karl Pilkington, whose offbeat musings and pointless conversations are the basis of many of the storylines. Topics covered in season two include 21st-century scientific innovations, bizarre medical stories, Ricky�s pet project to �Get Karl Famous� and Karl�s fascination with doppelgangers and twins. Also included are the regular features �Monkey News,� in which Karl describes the role banana-trained monkeys played in early space exploration, and readings from Karl�s diary. 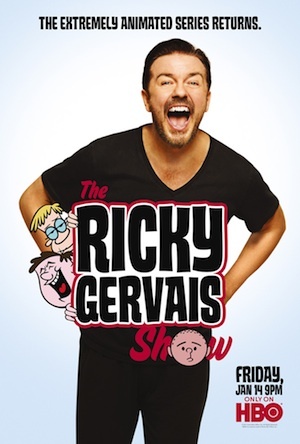 Season two of The Ricky Gervais Show premieres on Friday, January 14 at 9:00 p.m. ET/PT. Home Box Office, Inc. is the premium television programming subsidiary of Time Warner Inc., providing two 24-hour pay television services � HBO� and Cinemax� � to approximately 41 million U.S. subscribers.� The services offer the most popular subscription video-on-demand products, HBO On Demand� and Cinemax On DemandSM as well as HBO GOSM and MAX GOSM, HD feeds and multiplex channels.� Internationally, HBO branded television networks, along with the subscription video-on- demand products HBO On Demand and HBO Mobile�, bring HBO services to over 60 countries.� HBO programming is sold into over 150 countries worldwide.